As I’ve said before, the best place in the world to sail is obviously Kielder. But as part of my commitment to 3LT, (Look, learn, listen, travel, turn up and take part!) 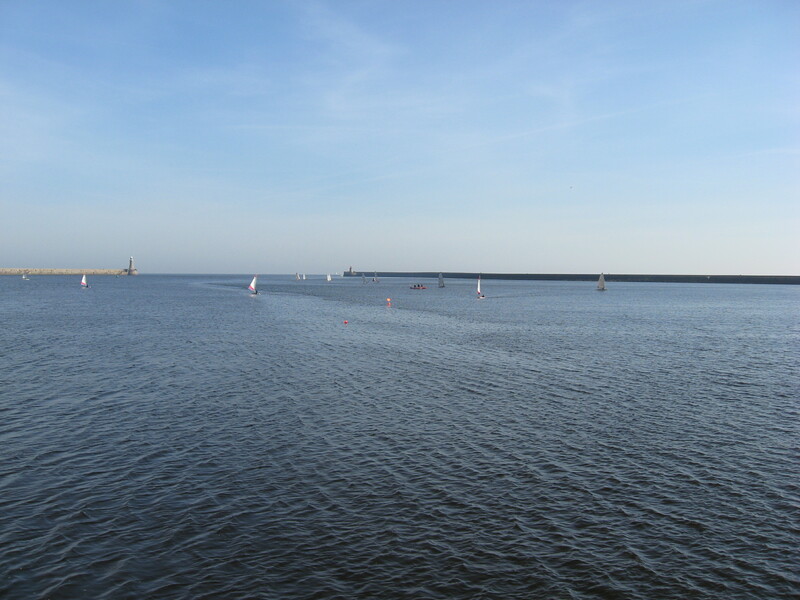 I started the year at an open event at a much more local club, sailing in the mouth of the Tyne. It ended up that despite turning up a lot, I only got to sail once. However it was such a lovely sun kissed, steady breezes, beautiful and scenic sail I did something a little foolish. I do have a plan and in essence it’s a good one. South Shields sailing club is only 8 miles from where I work. And they race on a Wednesday. So my genius master plan is to race there on a Wednesday night in my Vareo and do more cruising at Kielder. This makes perfect sense when you analyse that my very favourite Kielder sailing involves puttering up the lake to the pub for a pint and a bowl of chips – something that can be achieved in a particularly civilised manner in our Wayfarer. I am as yet uncertain as to how this will go down with my compatriots at Kielder. So far it’s been very quiet. Particularly when I have extolled the virtues of the sailing area and the fact that you can swing a very large cat in the ladies changing rooms. The only downside so far seems to be that I’m the only one in there. Hellloooooo!!!! Are any of you girls??? So I’m waiting for the horse’s head or a black spot to appear. Note to self, 3LT is all well and good, but you aren’t meant to join every sailing club you visit…. Funnily enough the phrase “Helloooooo!!! Are any of you girls?? ?” is also one of Buff’s favourites, though I believe he prefers “G’day”. I have no idea if it works or not. Please stop being cruel to that very large cat.